I was heading further north than I'd ever been without crossing over into Scotland. Winter is properly kicking in, and I won't be able to wander across moors and hillsides in the dark, so this was a bit of a last hurrah for 2012. I picked somewhere I thought was sufficiently urban, sufficiently easy to get to, sufficiently do-able. I picked Darlington. I booked my tickets a week in advance, so I could get points on redspottedhanky.com, and waited for my day out. Unfortunately, in the meantime, the Weather Gods decided to dump massive quantities of water on the North-East. Floods. Landslips. Drownings. Appalling catastrophes all over the place. The East Coast Main Line was thrown into chaos. I wasn't even sure if there'd be a train for me, but it was there, the 06:15 from Lime Street to Scarborough and Newcastle (splitting at York). As instructed, I sat in the rear three coaches for the Darlington portion of the train. The train started up, and as we hit Edge Hill, the camp conductor came over the intercom. It seemed that it wasn't guaranteed that we'd get to Newcastle. An embankment had collapsed onto the line between Darlington and Durham, but some trains were getting through on an alternative route; it was up in the air as to whether we'd be lucky. 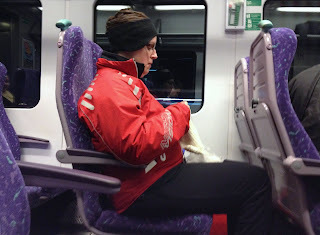 The woman across the aisle sighed and busied herself with her knitting. The morning slowly arrived as we headed east, first just a glow turning the black sky an inky blue, then streaks of pink and yellow light bursting out over hills and houses. I wasn't hopeful. The weather forecasters had seemed positive about today, saying there wouldn't be any rain, but that wasn't the problem: the problem was the after effects of all the previous downpours. I had ambitions for the day, and my pessimistic soul assumed they'd be dashed. After Leeds, the conductor made his announcement: we wouldn't be going to Newcastle. His announcement was a little garbled, since he continually mixed up Darlington and Durham. "Passengers for Durham... no, Darlington... can change at York. Passengers for Durham... no, Darlington... no, Durham, sorry... should get a rail replacement coach service from York." I opened the National Rail app: there was a train to Darlington leaving York about five minutes after we were due to arrive. Not too shabby. I'd never been to York station before, so that was an excitement in itself. I didn't have time to look around though - I had to find my train, which was on platform 10. There was a moment of panic when I realised I had gone in completely the wrong direction and was on platform 1, necessitating a mad dash back over the bridge I'd just used, but I made it in time and we headed onwards. It meant I could finally see the effects of the flooding on the landscape. New lakes had formed in fields; trees became islands. A man in wellies was tentatively testing the depth with a stick in front of him. We were only a foot or two above the new sea level. After a pause at Northallerton we pulled into Darlington station. Which was a delight. A proper, old-fashioned iron and steel Victorian terminus. I loved it. I shouldn't have been surprised, of course. Darlington is where the railways began, after all. The Stockton & Darlington railway was opened in 1825, largely as a means of getting coal from County Durham out to the coast, but with a nice little sideline in passengers. This was where George Stephenson trialled his steam engine - the Locomotive - and where ideas about transport were first formed. The Liverpool & Manchester Railway may have been the first proper intercity link, but the Stockton & Darlington was where its seeds were sown. It's been commemorated with a lengthy frieze across the ends of the bay platforms, commissioned, according to the plaque, to celebrate 150 years of the railway. Local art teachers did the painting, and the text is all in that good old reliable railway font. Less lovely are the customer facilities. A travel centre and shops have been inelegantly inserted into the frame of the building, 1970s intrusions that have no regard for the rest of the building. It's like they just didn't care, isn't it? I don't have too much respect for the heritage lobby. I don't see the point of preservation for the sake of it. That doesn't mean that I support ugliness, though - it just means that I want buildings to be used properly. Was this the only way they could insert a WH Smiths? Really? I couldn't work out how to get out of the station, at first: there seemed to be tracks blocking the way all over the place. Finally I realised that the gloomy looking subway was actually the way out. I emerged in a car park. The station's got a bay it doesn't need any more - which would be the perfect place for the ticket office and the shops, incidentally - and they've turned it into a pay and display area. It feels a bit grubby. At first I wasn't even sure if this was the proper exit. The big impressive tower outside, complete with the double arrow logo, reassured me that I was in the right place. Which was lucky, because there wasn't a single station sign. Come ON, Darlington. You're the birthplace of the railways! You must do better. No sign, a rubbish car park, a manky travel centre... no, if I'm honest, the lack of a sign was the thing that annoyed me the most. That and the man on the tannoy whose Durham accent was so thick I couldn't understand a word he said. It sounded like someone gulping down jelly on a loudspeaker. I had to go back through the subway, back into the station, and settle for this as proof that I'd been there. Bad show. I walked down the hill and into the town. The river was pouring through the culvert by the ring road, filthy brown from the floods, just managing to splash the brickwork on the bridges as it passed. I realised that the footbridge, further on, was actually where the man from the BBC had stood the day before. He'd started in the morning, excitedly pointing out that the water was just below the bridge deck, and then sounded more and more dejected as the day wore on and it didn't get any higher. I think he was hoping for an exciting flood, and maybe an appearance on Auntie's Bloomers fleeing the deluge. It's funny; that photo makes it look quite pretty. What you can't see is the ring road on the right, and Darlington's astonishingly ugly Town Hall on the left. I take that back. Yes, the Town Hall is a massive lump of grey concrete, completely out of all proportion - but it's so hideous I quite liked it. A bit like how a really ugly dog is actually quite endearing. Even the large, windswept plaza outside couldn't dim its charms for me. The town was far nicer. It was humming with activity; busy shoppers clattering about trying to be good and finishing their Christmas shopping early. The decorations were up - they always look a bit sad in the daytime, a bit run down. It's almost as if they're sulking because they're turned off. There was a fine market hall, with a clock tower. I stopped to take a photo and got a smile from a passer by - not a "what an idiot" smirk, more a "it is a great building, isn't it?" sort of look. I was cold by now, and tired and hungry. Normally I'd have stopped for a cup of tea, but I had places to go, so I nipped into Cooplands Bakery for a pork and cranberry sausage roll. Unfortunately, while Sayers are quite happy to throw baked goods at you that scald the roof of your mouth and give you bright red fingertips, Cooplands prefer to give you a tepid sausage. Disappointing. 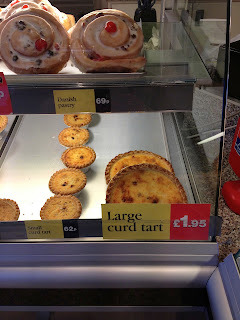 I found myself staring behind the counter - what the hell is a curd tart? I thought maybe it was what they called an egg custard, but a bit of subsequent Googling reveals that it's a sort of cheesy tart with raisins in it. It's a Yorkshire speciality apparently. I think I'll stay on the western side of the Pennines when it comes to baked goods. I was pleased by Darlington, but I didn't have time to hang around. There's a railway museum in the town, next to North Road station, and I could get in a half an hour visit before my train arrived. I wandered out of the town, after a bit of hassle crossing the ring road. There were barriers circling a roundabout, herding pedestrians back and forth, but seemingly offering no way of actually crossing it. Only after a bit of searching did I find the subway, leading to one of those pleasing roundabout islands where you're below the traffic in a little green oasis. I love those, though there I do always wonder what would happen if someone blocked up the subways and trapped me down there. I think I'd just go feral and make it my own private kingdom. 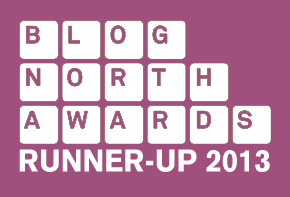 They'd find me, weeks later, shaggy of beard and stark naked, talking my own made up language and living off discarded chip wrappers that got blown down there. Through a tremendous act of will, I managed to walk past the Art Deco Odeon without going in and watching Skyfall; I've only seen it three times, after all. (I did check the showtimes as I passed though... just in case). Crossing the road by Sadie the Bra Lady (that's a shop, not a local woman with her baps out) I headed up Station Road towards the Darlington Railway Museum. Sorry - Head of Steam. Presumably extensive market research indicated that people were more likely to visit if it sounded like a pub, rather than a museum. The museum's housed in the old North Road station, a lovely building that reminds us how good station architecture can be. And that's all I can tell you about the station because, unfortunately, it was closed. In the summer it opens at ten am, but after October it opens at eleven. All I could look at was the car park, and a very nice replica of Stephenson's Locomotion in the forecourt. I wished I'd read the opening times on the website more carefully; I could have had that cuppa in the town centre after all. Now I had a half an hour wait at what's left of North Road station. This must be the most dramatic fall from grace for any railway station on the network. The main building and engine shed have been replaced by a purple shelter that doesn't even have any seats. The old station was clearly visible through the bars, taunting me with its prettiness, while I stomped around on the sodden tarmac to try and keep warm. Even the old station sign's prettier. Not quite sure why a railway museum nowhere near the coast is doing a Titanic exhibition, mind. Also, there's no way to get into the museum directly from the train, which seems odd; you have to go round the block to get in. I know it only gets served by decrepit old Pacers these days, but railway fans are railway fans. The track is covered at one end by the old shed, but passengers are barred from going that far. This is presumably a Health and Safety precaution, as it's not in great shape. The glass in the roof is broken, the supports look weak, and local graffiti artists have scrawled all over it. It could be a decent waiting area for the poor souls sheltering from the Teeside winds, but obviously, that's just a pipe dream. I rammed my hands in my pockets to keep them warm. I was the only passenger waiting - it wasn't the kind of place you'd hang around if you didn't have to. I missed that cup of tea. Darlington town hall doesn't look that bad to me. At least, not in that photo. What with the bare trees in front, it has a touch of the Cold War about it. I reckon it's the headquarters of SMERSH. That's interesting, the Titanic exhibition was at Carnforth a couple of months ago. Curd tarts are delicious! And to describe a breeze in Darlington as a 'Teesside wind' is pushing it. Interesting posts, though, thanks. Will drop back when you get to Cleveland.